This image by Jack Kerouac, among those on view at the New York Public Library, has an emptiness about it that makes it difficult to view. It's not the subject. 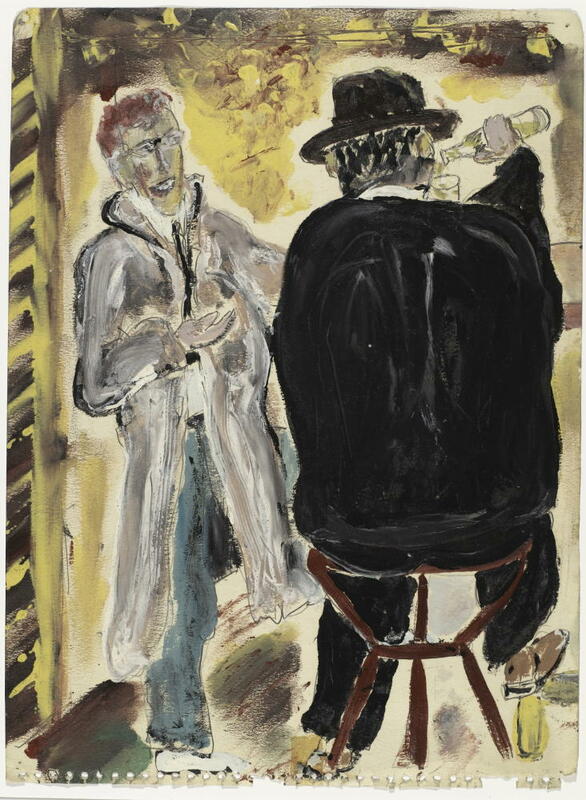 Images of drinkers aren't necessarily gloomy (Frans Hals) and even grimy images, such as from New York's Ashcan School, still have a certain nobility. What's depressing about this image for me is the sense that Kerouac is struggling to his own inner sense of being lost, creatively. That means the soul. 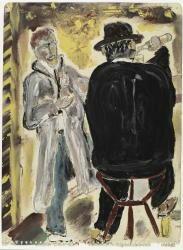 I wrote yesterday about my sense that Kerouac's paintings show an unhappy searcher -- not the gloriously curious, determined searcher of "On the Road" or even "Big Sur." I see him as truly "beat" ... not hip beat, but beaten down. Why did he chose drinkers for this study? He was certainly spending a lot of time with them. He often would share bottles with vagrants and seamy folks at bad places, and was severely beaten up at least once during these post-success years. He floundered creatively, and his drinking went from a way to have a good time to full-fledged alcoholism, which is grueling for the drinker and those around them. ABOVE: Jack Kerouac. “The Drinkers.” Oil and pencil on paper, ca. 1963. New York Public Library, Berg Collection. Reproduced courtesy of John G. Sampas, legal representative of the estates of Jack and Stella Kerouac. On view as part of the exhibit "Beatific Soul."